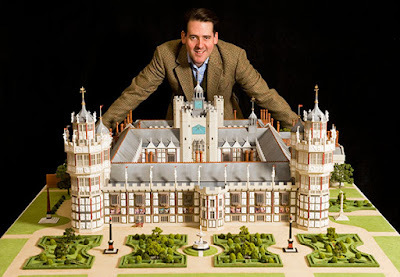 Ben Taggart with his model of Henry VIII's Nonesuch Palace. I’ve been interested in model building ever since I was a child, and even today still dabble in it from time to time—sometimes for historical miniatures wargaming, or building scenery for a slot car track in the basement. I suppose this is why I can appreciate the magnificent skill that Ben Taggart displays with his highly detailed architectural models. My first introduction to his work was seeing a photo of one of his most impressive works—a miniature recreation of Henry VIII’s Nonesuch Palace, which is now on display in South London. I suppose I was so overwhelmed by the well-researched vision of Henry’s lost palace that I did not stop to consider the time, effort and craftsmanship required to actually build the model. Consider this a remedy to that oversight. Ben applied his research and modelling skills to projects large and small. 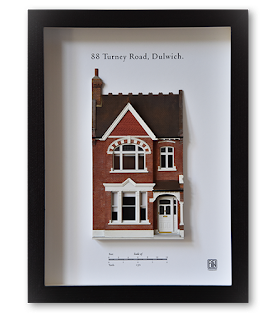 On the more modest side, he does unique, hand-framed, low-relief models of houses by commission. These present somewhat of a challenge due to the limitations in depth, so some elements of a home may be foreshortened to fit inside the frame. 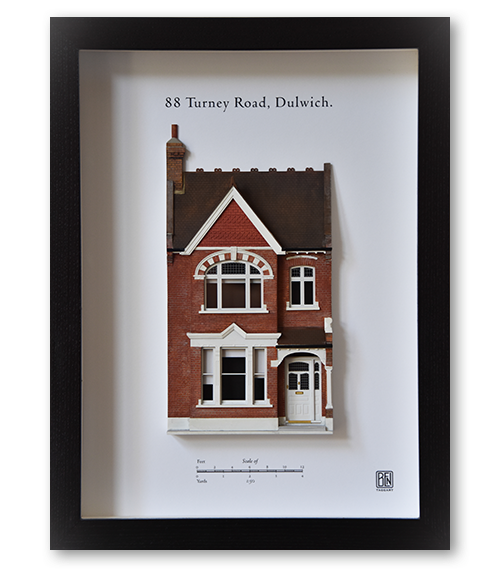 Nevertheless, the finished examples are quite fine to behold and would be a welcome addition to any homeowner’s wall. On a more advanced level, Ben tackles larger, full 3-dimensional “house portraits” for clients as well; fully-detailed and capturing the full color and texture of special buildings that are cherished by their owners. Using wood as the primary material, Ben also utilizes fiberglass, plaster, plastic and brass to achieve a remarkable level of detail in each model—a process that may take several weeks or even months, depending on the size and complexity of the project. The Nonesuch project represents Mr. Taggart’s range of specialist museum work, which is truly impressive. Besides the Nonesuch Palace model produced for Friends of Nonesuch, he has also created a scale model of the Auschwitz concentration camp for the Imperial War Museum’s holocaust exhibit and a brilliant model of the reconstructed Roman Baths for the City of Bath museum. All of these works represent many months of painstaking research and effort, all of which produce a significant “wow” factor wherever they are installed. 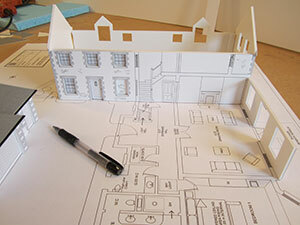 For owners who wish to commemorate a special house, government or business planning groups who might benefit from a 3-dimensional rendering of a project, or museums desiring a very special attraction, we are convinced that Mr. Taggart offers the commensurate attention to detail and skill needed to pull it off.